Richtig. Die beliebte Schauspielerin Jennifer Ansiston hatte also einen so berühmten Patenonkel. Ob Sie wohl damals ahnte, dass sie auch Schauspielerin werden würde? .....von Nicolette Sheridan. Nicolette ist heute ein Superstar und spielt in der Serie "Desperate Housewife" (Edi Britt). Nicollette Sheridan wurde am 21. November 1963 in Worthing in England geboren. Ihr Halbbruder Nich Savalas stammt aus der Ehe ihrer Mutter mit Telly Savalas. 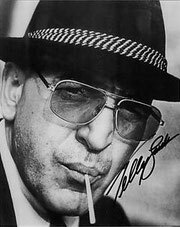 Eines der wenigen Bilder von Telly Savalas mit seinen Brüdern. Das Bild stammt aus dem Jahr 1980. Teddy Savalas, Telly Savalas, Gus Savalas und George Savalas. MOTHER: Christina Savalas. Died 1988. BROTHER: George Savalas Demosthenes. Actor. Died October 2, 1985 of leukemia at age 58; played supporting role on "Kojak", billed first as "Demosthenes" and later as "George Savalas". DAUGHTER: Christina Savalas. Born c. 1951, mother Katherine Savalas. DAUGHTER: Penelope Savalas. Born c. 1962, mother Marilynn Savalas. DAUGHTER: Candace Savalas. Actor. C. 1963, mother Marilynn Savalas. SON: Nicholas Savalas. C. 1973, mother, Sally Adams. SON: Christian Savalas. Born c. 1984, mother Julie Savalas. DAUGHTER: Ariana Savalas. Born c. 1987, mother Julie Savalas. WIFE: Marilynn Savalas. Married in 1961; divorced in 1974. WIFE: Julie Savalas. Travel agent. Born c. 1957, married from 1984 until 1994. Ariana Savalas macht im folgenden Clip sehr sympathisch Werbung für die TV-Show Kojak. Ariana Savalas (born January 9, 1987 in Los Angeles) is an American jazz fusion vocalist, musician, and songwriter. Her first single "Perfect Man" was released in January, 2012. The music video features actor Eric Dane from ABC's Grey's Anatomy. Savalas began her career as a jazz singer in the Los Angeles cabaret scene then quickly advanced to a national stage, performing at venues including the New York Friars' Club, and events such as the annual Frank Sinatra celebrity invitational, Smokey Robinson's Foundation Gala at the Waldorf Astoria, Herb Alpert’s Vibrato in Beverly Hills, and Palm Desert's McCallum Theatre. Savalas penned her debut single, Perfect Man, produced by Mark Portmann, calling her style of music "Anthem Jazz" drawing influences everywhere from Freddie Mercury to Jessica Rabbit and The Beatles. Also featured on Perfect Man are guitarist Tim Pierce and bassist Paul Bushnell. Savalas is an artist. She designed the sketchwork for her album cover art. She made a guest appearance as an actress on CBS' hit drama Criminal Minds.